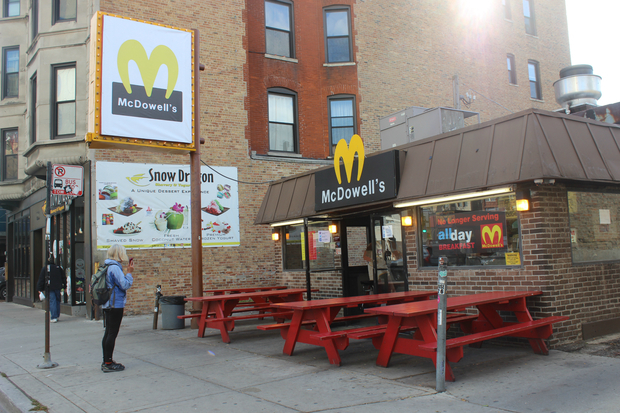 For Halloween this year, Wiener&apos;s Circle, 2622 N. Clark St., dressed up as "McDowell&apos;s," the fictional restaurant from the 1988 film "Coming to America." 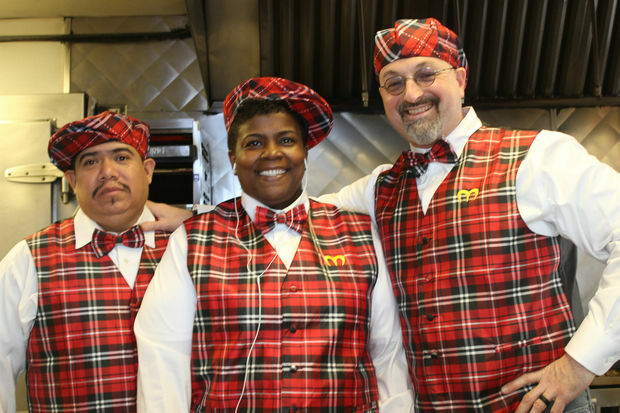 LINCOLN PARK — Wiener's Circle — the famous hot dog joint known for its sassy staff — went all out for Halloween this year by completely transforming into McDowell's, the fictional restaurant from the 1988 film "Coming to America." 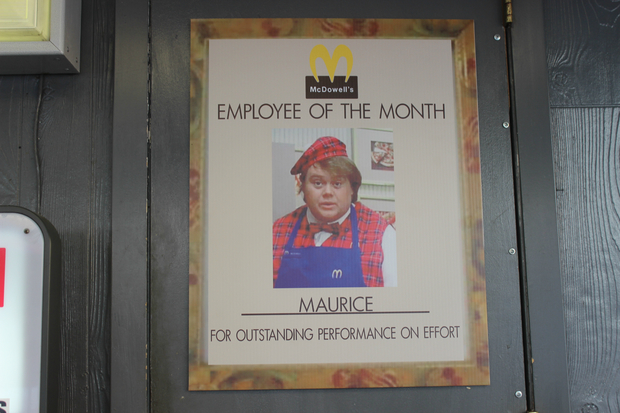 On Friday morning, the restaurant's general manager Scott Brooker orchestrated the transformation of the restaurant at 2622 N. Clark St. by replacing the signs, outfitting his staff in red-and-yellow checkered McDowell's uniforms and even putting up fictional menus and an "Employee of the Month" flier depicting Louie Anderson, who played Maurice in the film. Brooker said the idea came from the new owners, a group of five local investors who bought the 33-year-old restaurant in September. The new ownership was first reported by the Tribune. Prior to the sale, the restaurant was owned by Larry Gold and Barry Nemerow. "The new owners are big fans of shock value. With McDonald's across the street, it was perfect," Brooker said. Customers were both confused and intrigued passing by the restaurant Friday, with some of them snapping photos or wandering in to find out what was going on. For the uninitiated, McDowell's is the restaurant where Eddie Murphy's character Prince Akeem works in the film. The restaurant's owner, Cleo McDowell opened it to rip off the McDonald's across the street by offering items like the "Big Mick" instead of the "Big Mac" and having a similar logo. Brooker said it's the first time the restaurant has ever completely transformed for Halloween — and it wasn't cheap. "It was definitely costly," he said, declining to provide an amount. "We're not going to make any money this week but we wanted to make a splash." As of Friday afternoon, Brooker said the employees at the McDonald's across the street at 2635 N. Clark St. had yet to say anything to them. The restaurant will be Wiener's Circle again come Monday. Over the years, the restaurant has become a Chicago staple thanks to its sassy staff, who are verbally abusive in a tongue-in-cheek kind of way. This American Life profiled the restaurant in 1996. One of the signs in the restaurant, referencing the 1988 film.